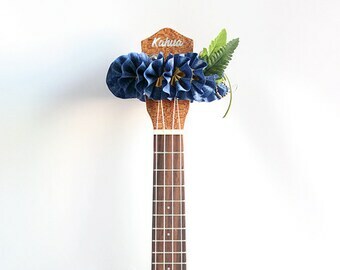 Purchase any 2 ukulele leis, and let me know your 3rd one (This is limited only to plumeria or hibiscus flowers) you'd like for free in the comments upon checkout. Please let me know if you want Wrapping. 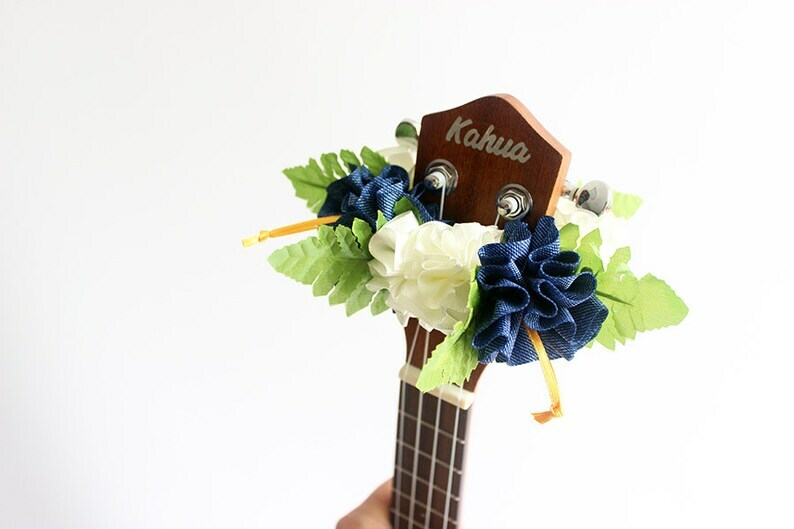 This is ribbon lei for ukulele. 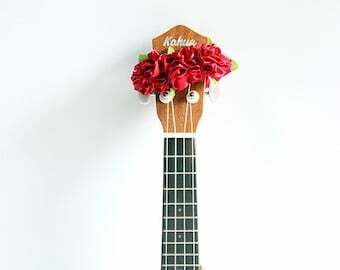 This is the head accessories of ukulele.It is made with ribbon. Size is free. (These lei have stretchy. Also available for key ring of the ukulele gig bag. The delivery is available to all over the world. The Product is sent from South Korea. For the sake of mutual security, I accept only Paypal. We are mainly using Korea Post Office's Small Packet Flight Service(Economy International Shipping). ★Normally, the delivery is made within 2-3weeks after your order is shipped,The delivery may be delayed for certain some reasons. Delivered around 14-21 Business days. Delivered around 10-14 Business days. Delivered around 14-30 Business days. EMS is the fastest and the safest delivery method. It takes around one week to arrive. 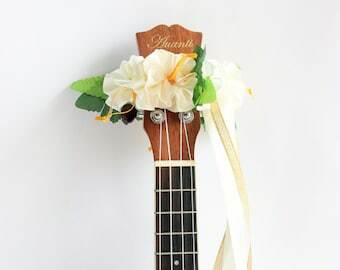 Beautiful headstock lei. 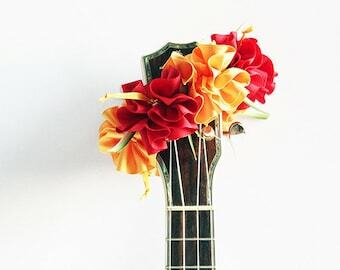 I got one for my guitar and one for my Uke. No problems at all. Beautiful, well-made, and efficient shipping. For the item to be returned with some reasons of yours (as a rule, the item should be not used), I accept the returned item within 3 days after you receive your order.For the cost of returning the item, please pay for the cost of shipment yourself. The delivery is available to all over the world. The Product is sent from South Korea.For the sake of mutual security, I accept only Paypal. We are mainly using Korea Post Office's Small Packet Flight Service(Economy International Shipping). It has tracking number. Please note : Some country postal services do not provide on-line tracking for Small Packet Flight Service. So you can track your package only while it's in South Korea. the display on your screen.